I am never one who has been very good at winning lucky draws or giveaways. I was surprised when I was informed by a fellow fountain pen lover that I had won the Fountain Pen Revolution giveaway back in March 2015. It was weird that he was more informed than me over whether I won the giveaway or not. I promptly thanked him and claimed my prize. The giveaway was part of the Fountain Pen Revolution's launch of their new pen - FPR Indus. The pen reached me quickly in about 1 week or so. I set about inking it up. 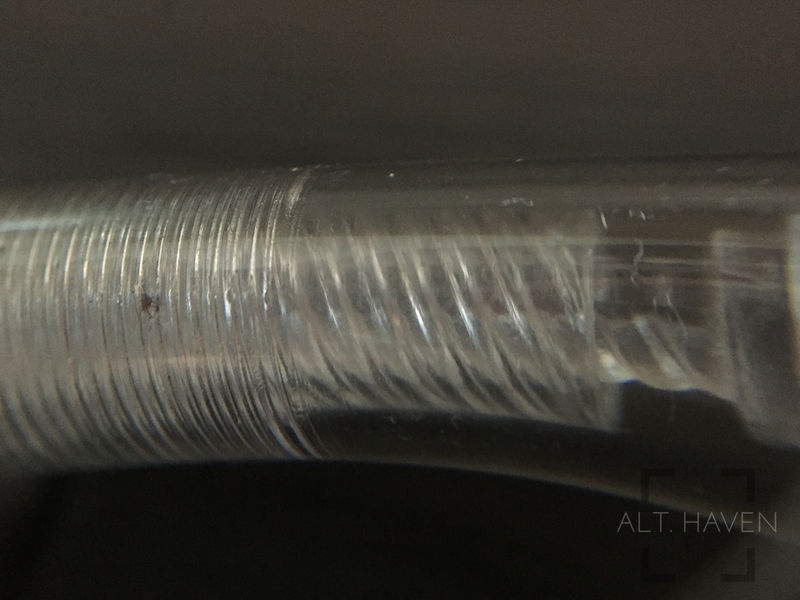 My Indus is a clear demonstrator fountain pen. It is accented with gold clip and centre band. The pen has a smell that I have come to associate with my old Noodler's Konrad. Most probably they were made of similar material since both pens are made in India. The cap unscrews easily with 2.5 turns. 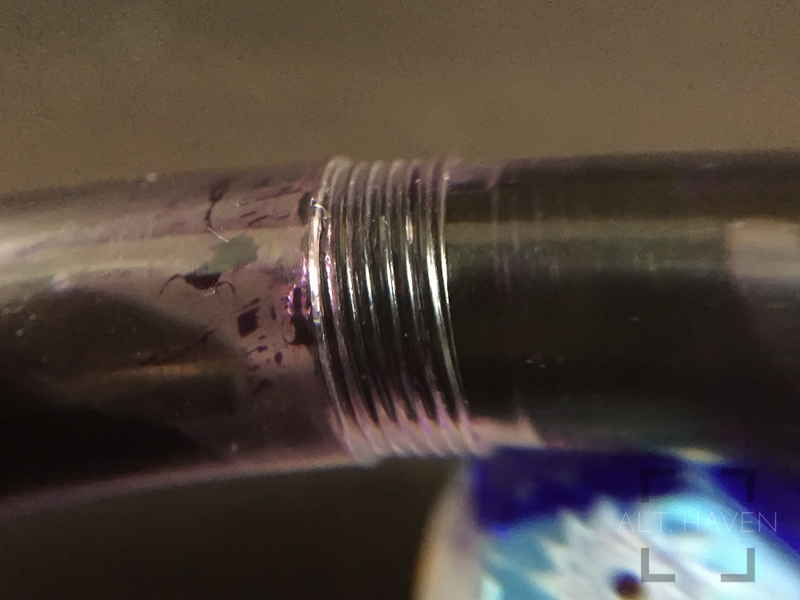 The clear cap is usually a source of my OCD trigger if ink get flicked inside the cap. The gold clip is a cheap feeling metal clip with a blob at the end to allow the clip to slide easily over paper or fabric. Though the FPR is a very afforadable pen but I had expected the clip to be better made. It doens't stay put in one location of the cap, instead I can spin the clip around the cap. The clip is secured to the cap via a what seems like a screw in type finishing which in turn secure it to the plastic cap. The rest of the body and barrel is entirely clear. The piston filling mechanism is also made of clear plastic. This is a touch I appreciate. 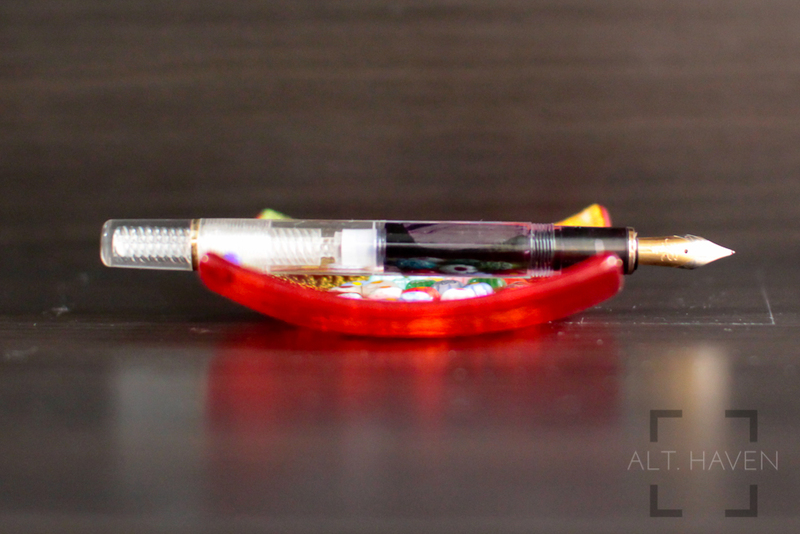 It enhances the look of a demonstrator pen, something I wish TWSBI would adopt. The piston works smoothly and easily right from the start. By the looks of it, it seems that the Indus was made to be easily disassembled. Though I have not tried it myself, you can check out this video to see how it is done. The Indus isn't a heavy pen. It is light weight and well balanced unposted. I felt that it was back heavy post the cap. There isn't a huge jump between the grip section and the barrel. Plus the threads are smooth and do not bite my fingers when I write with the Indus. I had opted for the clear version of the Indus with a fine nib but they come with the option of an EF, F, M, B, 1mm stuf and a flex nib. The Indus comes with a two tone nib which features the logo of the Fountain Pen Revolution and some scroll work. The nib writes well out of the "box" (It didn't come with a box) It is a smooth and well writer. I am surprise at how well the nib works. It works better than some more expensive pens that I have purchased. I am looking at you Sailor My First. The FPR Indus is a pen full of surprises. It is an very affordable piston filler fountain pen which is available in a wide variety of nib sizes. Plus it is also available with a flex nib. Though I hadn't had a chance to try their flex nib but I would say for their price it might give the Noodler's range of flex nib pens a run for their money. Though the build of the pen isn't fantastic but the pen cost less than many others. The Indus writes better than some well known entry level pens right out of the box. What more can you ask for?